When NorOntair’s Dash 8-100 powered into the sky in December 1984, it marked one of the most important events in Canadian aviation history. Not only did the fledgling airline, a subsidiary of the provincial government’s Ontario Northland Transportation Commission, provide essential passenger service connecting the dots in remote Ontario locations, but it also debuted the PW100, one of the crowning jewels of Longueuil, Que.-based engine manufacturer Pratt & Whitney Canada (P&WC). It’s a model also used by Canadian airlines flying reliable Dash-8s and Bombardier Q400s such as Porter Airlines, Air Canada Jazz and WestJet’s Encore. And fuelling it all is an ironclad relationship between Bombardier and P&WC, two iconic Canadian aerospace companies working together to drive aerospace here and abroad, now and into the future. The PW100 engine is a great Canadian aerospace success story that illustrates just what happens when you blend ingenuity, teamwork, and creativity with good old-fashioned hard work. It’s an engine that defines the pioneering spirit illustrated by Canadian aviation and aerospace companies on the global stage – creating reliable, dependable products that exceed expectations for customers worldwide. P&WC launched the PW100 family to extend its turboprop power range offering from its then current 1,000 shaft horsepower (shp) at the end of the of PT6A family. The engine has since grown from 1,800 shp to more than 5,000 shp, incorporating the latest advanced technologies on an ongoing basis to meet changing market conditions and customer needs. In addition to airline use, the engine series has demonstrated a diverse and varied range for a number of operations including aerial firefighting (Bombardier’s CL-415 water bomber), amphibious aircraft and military transport airport aircraft including the Airbus C295, a competitor for the Canadian Fixed Wing Search and Rescue program (FWSAR). With 38 PW100 model types developed since the 1980s and some 8,000 engines producing more than 155 million hours of flight time since its inception, the PW100 engine is easily one of the most impressive and successful aerospace products ever built. Exceeding expectations and creating products that meet – and exceed – customers’ demands is a description that aptly fits the PW100 family of engines. And if there’s one person who has developed an intimate knowledge of the PW100 program, it has to be Richard Dussault, P&WC’s Vice President of Marketing. Dussault has been involved with the PW100 project since its first flight. He was an application engineer during the program’s inception and was put in charge of helping ATR install the engine. He has since joined other P&WC employees in designing a product that has stood the test of time – more than three decades of commitment, development, and refinement. So, it was hardly surprising Dussault was beaming when discussing the engine’s anniversary with Wings during a recent visit to the P&WC plant in Longueuil, Que. 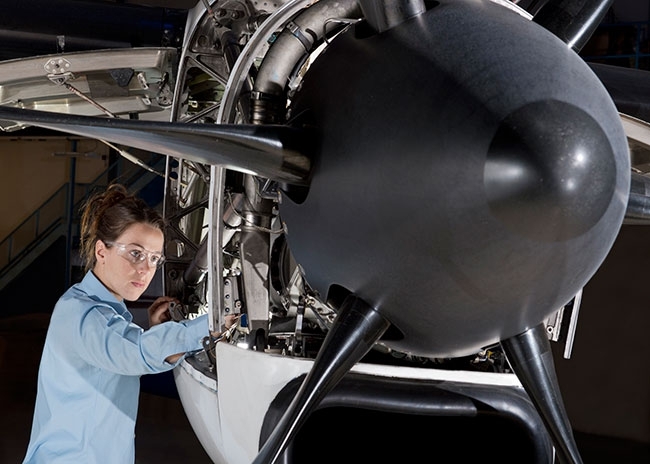 Turboprops deliver customer value because of their speed, efficiency, and cost-effectiveness. Environmentally conscious and durable in many environments, they are ideal for the Canadian market where connecting cities in a radius of up to 400 nautical miles from a larger hub is both quick and affordable to both consumers and airlines. Turboprop engines also have ideal propulsion efficiency, some 40 per cent more efficient than jets. With a speed range of 300 to 350 knots, however, short haul trips are best. P&WC started its development of the PW100 engine in 1977. The PT6 was reaching a certain level, but a new product was needed. “They are still going strong and the company is still developing new technologies for it,” Dussault said. “But the base architecture, at a certain point and time, you want to have more mass flow, you need larger compressors. So, we were looking at an engine that has 2,000 to 3,500 shaft horsepower, a bigger engine. That was also in the days of deregulation, so we were at the right place – a perfect good storm. Pratt also had the advantage of a very strong marketing campaign, which helped them win contracts with Embraer, ATR, and in (prior to becoming Bombardier) De Havilland Canada, the Dash 8 family. All three PW100 engines were developed back-to-back, Dussault said, and the first two, the 120s that power the ATR and the Dash 8, were certified in December 1983. The PW124 and PW127 are all derivatives of the main engine design. It’s a three-shaft engine as opposed to the PT6, which is a two-shaft machine, so the PW100 created more power. As Dussault noted, the PW100 team changed the front compressor and the turbine that goes with it puts more capability into it. These models are also a bit bigger engine of the PW100, but the core of the engine, the HP spool, remains largely the same with all the models. The team was also able to generate different models by putting in different gearboxes – the 120 series, the 124 series, the 127 series. As more mechanical applications were added, shaft horsepower increased from 2,000 to 2,400 to 2,700 shaft horsepower and subsequently, the gearbox increased. P&WC is busy looking into the future for the Next Generation Regional Turboprop – a 90-seat version that will boast greater passenger comfort and destination options. Such an aircraft, Dussault said, would have a power plant in the 5,000- to 7,000-horsepower range to power it on longer haul trips. The Dash8-100 was the first PW100-powered aircraft to enter service in December 1984 with the regional airline NorOntair.